The OpenLM Utilizer is a licensing management software. It provides productivity tools for system administrators, managers and end users. OpenLM’s basic software package includes the core OpenLM Server module and its user interface; the OpenLM EasyAdmin module. In addition to these core components, the OpenLM software package includes modules and capabilities which provide additional functions. In order to interface these components and obtain full functionality of the OpenLM software, it is essential to open certain port numbers. The OpenLM Server is the core element of the OpenLM Utilizer system. It integrates the functionality of all other OpenLM peripheral system components, such as the OpenLM EasyAdmin, OpenLM Agent, OpenLM Alerts, and OpenLM Broker. It is responsible for collecting information from various system components and storing it in an embedded relational DB. External databases like MySQL and Microsoft SQL Server version starting with 2012 are also supported. 1. The OpenLM Server interfaces the License manager over a dedicated port. this port’s default number is 7016. 1. In the OpenLM Server configuration window, select the Port Settings tab. In the License managers reporting port text-box, type in the OpenLM server port number (e.g. : 7016). Search for the line <Port>7016</port>. The OpenLM Agent facilitates available license querying, among other functions. It connects to the OpenLM Server through a dedicated port. The OpenLM Agent default port number is: 7012. 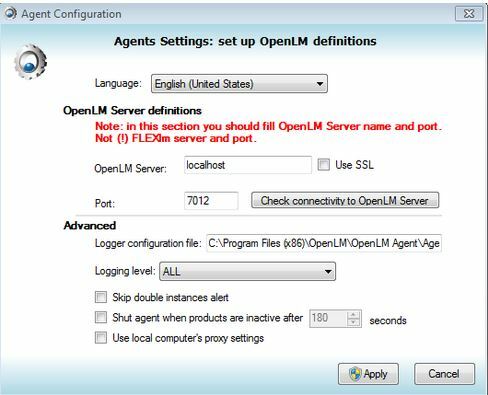 The OpenLM Agent port number should be configured the same on the OpenLM Agent configuration tool, and on the OpenLM Server configuration tool. 2. 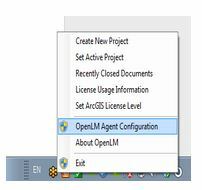 Click the OpenLM Agent configuration tool. The Agent Configuration window pops. 3. Type in the port number in the Port textbox (e.g.:7012). 4. 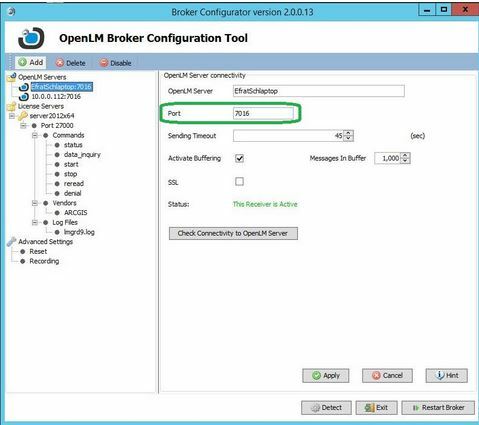 In the OpenLM Server configuration tool, select the Port Settings tab. Type in the Agent port in the Agent reporting port text-box (e.g. : 7012). This port enables EasyAdmin web application to send requests to the OpenLM Server. This port number should be configured the same on the OpenLM Server configuration tool, and on the config.js file. 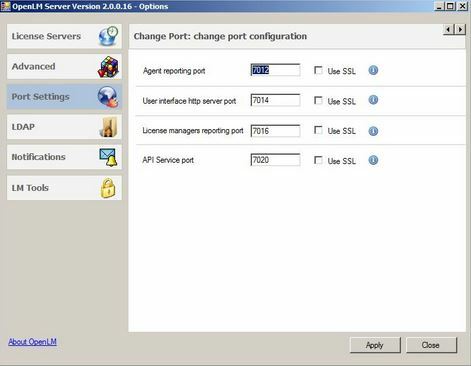 From the OpenLM Server configuration tool, select the Port Settings tab. Type in the HTTP Server port in the User Interface HTTP Server Port textbox (e.g. : 7014). 2. Search for the number 7014. 3. Edit the port number(Should be 7014). 1. <hostname> stands for the OpenLM Server machine host name. 2. 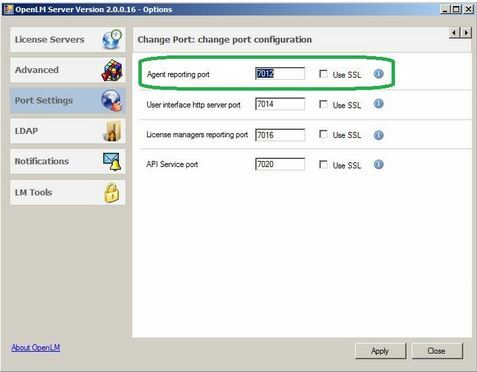 The port number (7020 in the example above) is the default port for the SOAP proxy. 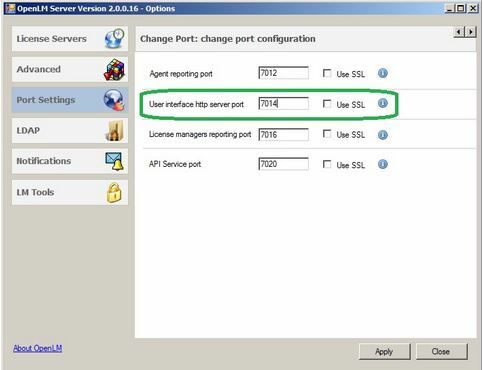 You can change it in the OpenLM Server configuration tool –> Port Settings tab. 3. It is not recommended to access the OpenLM Database tables directly, as OpenLM is not obligated to keep the Database tables’ structure through upcoming version releases. OpenLM installs the LightTPD web server with the installation of OpenLM Server. LightTPD is configured as a Windows Service and starts up with the machine. The use of web servers such as Apache or IIS or others is also supported. 2. Search for the line “bind to port (default: 80) server.port = <port number>”. 3. Edit the port number (e.g: 7019). 4. Restart the LightTpd service. 5. Change the EasyAdmin URL line to reflect the changed port. For information on IIS 7 and SSL configuration please refer to this document.